Earlier this summer, I made my first ever wedding cake. In the baking world, the wedding cake is a milestone. It's not just butter and eggs (although my there was a lot of butter and many, many eggs - more on that later). It's spreadsheets. It's internal structure. It's multiple oven timers. It's fractions and long division. In short, it's a challenge not to be trivialised for anyone for whom GCSE maths is a distant and rather unpleasant memory. The pre-event nerves, the preparation and afterwards, the sheer relief that it's over and it worked are like your first kiss - although the less said about that the better. After all, my parents read this blog. Back to this summer, and to the cake. The cake was for lovely friends who were planning a thoughtful, home-made wedding for 150 guests. They were, thankfully, very relaxed and hadn't even planned to have a cake at all. The ceremony took place in a tiny church with guests squeezed into every nook and cranny. 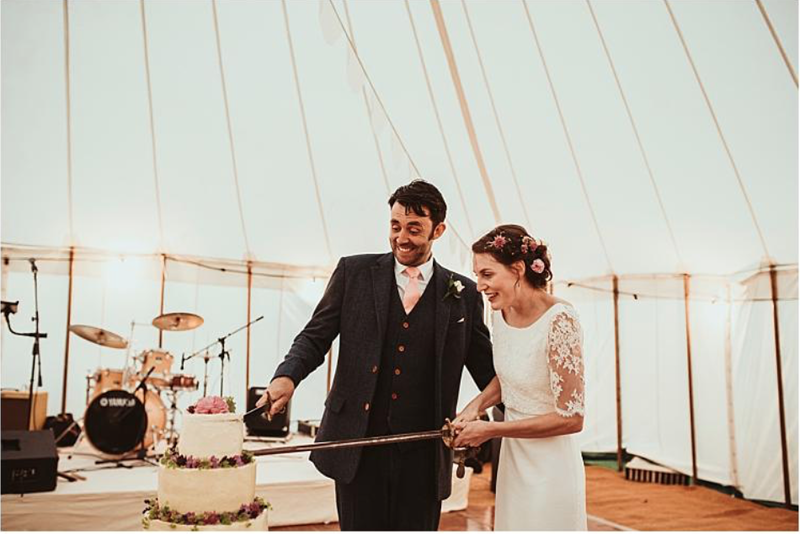 The path from the church was lined with white bunting, which led to a huge marquee in the bride's parents' garden. For such a summery, happy wedding it felt only right to chose homegrown, light and seasonal flavours. There were three tiers of four-layer thick almond sponge, filled respectively with elderflower and gooseberry, rhubarb and orange blossom and raspberry curd with fresh vanilla cream. 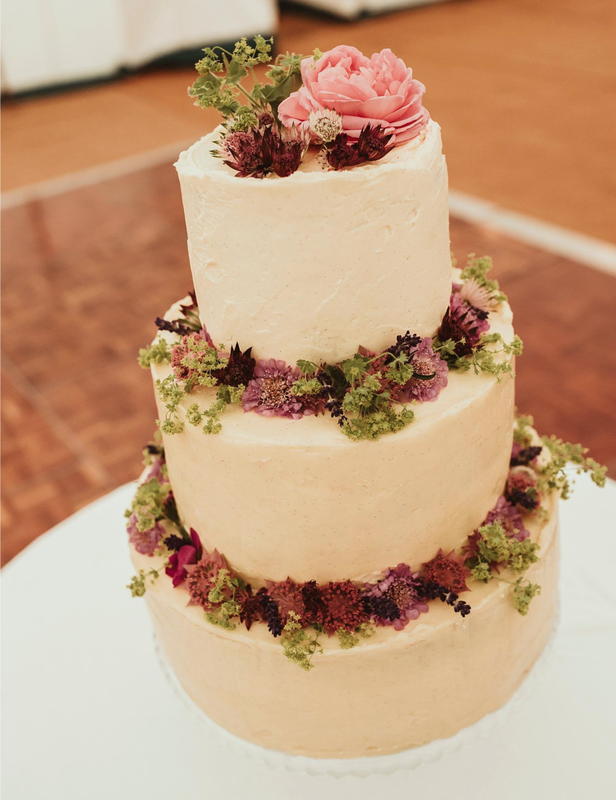 The whole cake was finished with vanilla Swiss meringue buttercream and decorated on the day with flowers from the garden. Most unusually, there is no recipe in this post. Instead, I wanted to share the things I learnt from making this cake. It was such a special experience for me, but it would have been easier if I'd known some of the following. I cannot wait to do it all again and so, if you are planning a wedding or know someone who is, please do get in touch. I would love to make a cake for you. Do not be tempted to wing it with a new recipe. You need to be confident that your recipes work, so practise any unknown elements ahead of the big day. You can do this on a much smaller scale to save on ingredient costs. If this is your first wedding cake, you will likely need to invest in some new tins. While it might feel like a big outlay, I really recommend spending a little more and investing in good quality tins, such as these ones by Silverwood. It makes such a difference to the bake, and once you've invested, they'll keep on giving. You will need to work out how much cake you need, then scale up/down your recipes to make sure you have the right amount of mixture to fill your tins. In a moment of organisational vigour, I made a six-page spreadsheet with columns for each tier and each recipe. While undoubtedly excessive, it did make the baking day a lot easier. Wedding cakes tend to be large and, consequently, you will need much larger quantities of ingredients than you usually do for baking. I got through over 5kg of butter (22 blocks, for anyone who is interested) and 70 eggs. Save yourself the stress and ordeal of carrying this back from the supermarket and order online. If you will need to source any specialist ingredients separately, call ahead. I spent a rather warm and stressful Tuesday evening trawling north London for early season gooseberries, and wouldn't recommend it. Before for begin, make space in your fridge. You'll likely need to chill numerous filled cakes, and the last thing you need is stray jars of mustard getting in the way. I made the entire cake using my Mum's Kenwood, which is older than I am and has certainly seen better days. I would not recommend it. If possible, try to borrow a second stand mixer of buy a second-hand one online. Two mixers would have halved the time I spent preparing cake batter and icing. As you are making your different fillings and icings, label them. They may well look similar, and this is an easy way to ensure you are adding the right fillings to the right cakes. Possibly the worst thing that could happen would be for your cake to collapse or fall over, so take the time to plan how you will be adding internal support to keep everything in place. I used Wilton's plastic dowel rods and thin poly coated cake boards for each tier, which worked perfectly. You can easily learn how to use these via YouTube tutorials such as this one. One of the scariest parts of the experience can be transporting the finished cakes to the venue. My poor father was under strict instruction to be careful and drove the entire journey at around 15 mph. Don't be tempted to drive an assembled tiered cake. It is a recipe for disaster. Instead, I recommend icing each tier on a thin poly coated cake board, and packing them in special wedding cake boxes like these, to assemble at the venue. Assembling the cake should be a simple affair if you have packed the cakes correctly and prepared your structure. Take an angled palette knife and a little spare icing in a piping bag for small touch-ups on site. Good luck! These beautiful photographs are by Jess Soper. You can view many more of her gorgeous shots on her website: http://jesssoperphotography.com. It looks beautiful but does sound very stressful. For about 5 minutes I could not tear myself away from looking at this cake, it is just gorgeous! I would also very much like to have exactly the same cake on my wedding with my bride Olga, we met each other just 6 month ago on this dating website http://dreamrussianbrides.com/relationship-with-a-russian-woman/, I hope she will like it! It is gonna be one of my surprises for her!) Thank you so much for posting! If you’re only planning to have an average or big sized wedding cake, it’s still super fun to check out some of the massive cakes ordered by other brides. If you need the best quality, don't forget to contact us. I was recently here and this is an amazing place for a wedding. I got a little carried away with the open bar at New York wedding venues. An open bar allows you to like any sort of music, even the most awful. Anyway, for those of you thinking to marry, this is the perfect spot.